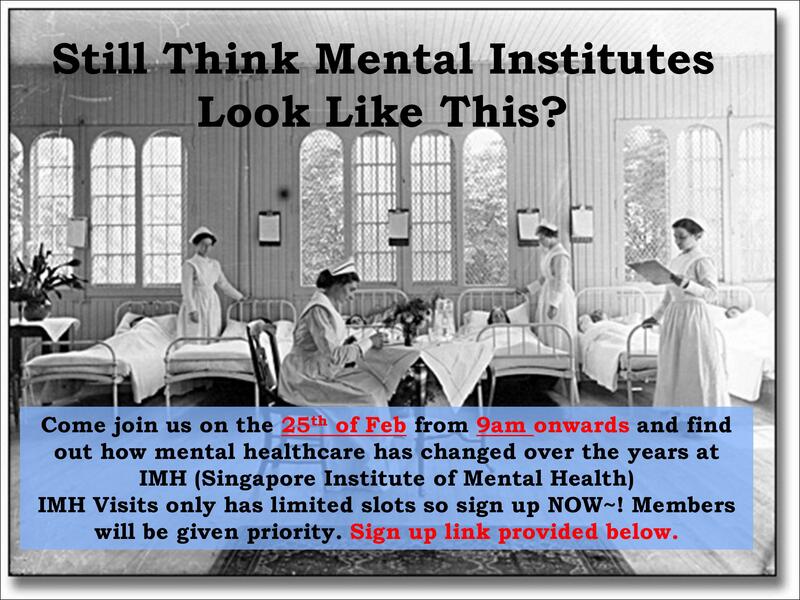 NUS Psychology is organizing a visit to the Singapore Institute of Mental Health (IMH) on the 25th of Feb from 9am to 11.30am! Ever wondered how it would be like to work in IMH? Or are you just curious to debunk the myths and horror stories of the place? No matter, your chance is HERE! *LIMITED TO 50 SEATS ONLY! WHAT ARE YOU WAITING FOR? – Due to the limited availability, PLEASE ONLY SIGN UP IF YOU CAN MAKE IT FOR THE AFOREMENTIONED DATE. For further details, look forward to a confirmation email that will be sent to you, if you have signed up, closer to the date of the tour. While members will be given priority during the allocation of vacancies for the tour NUS Psychology society reserves the right to curtail the privileges of members whose irresponsible behavior deprives others of the opportunity to attend the event.